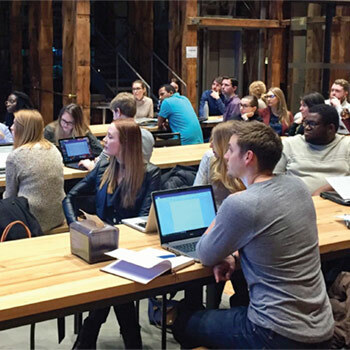 Wilfrid Laurier University’s first-of-its-kind Digital Innovation Skills Certificate (DISC) program graduated its second cohort of 30 young professionals in September. The program was created to connect recent college and university graduates from Waterloo Region with local small businesses to provide experiential learning opportunities in digital marketing, e-commerce and project management. Laurier alumni made up a significant portion of students in the two cohorts. The students worked in groups alongside an industry mentor and small business owner from Waterloo Region to apply the training they received in the first eight weeks of the certificate to a hands-on capstone project during the final five weeks of the program. Academic partners at Laurier and Conestoga College, along with corporate partners Shopify, HubSpot, and the Waterloo Region Small Business Centre, developed the certificate to support job creation in today’s innovative and technological workplaces. The majority of the inaugural graduating class gained meaningful employment immediately following the completion of the program. Robyn Burley, a graduate from the second cohort and Laurier alum (BA ’14), credits DISC's entrepreneurial and practical aspects in helping her secure a position as a digital marketing strategist for local agency Jelly Triangle. As a corporate innovation consultant at Communitech, Inglis believes that continuing education and professional development have never been more important.